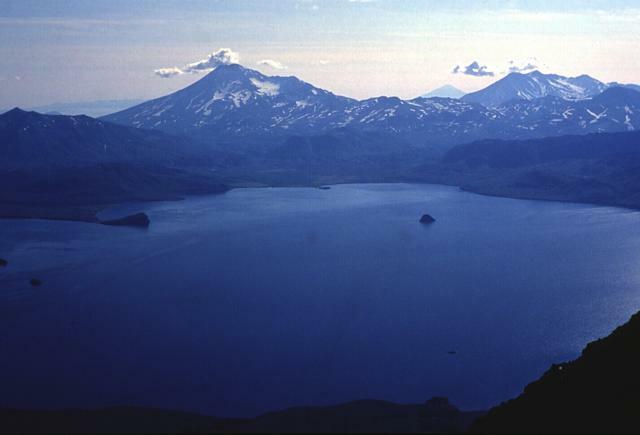 The last major eruption at Kambalny volcano was around 1350, although younger undated tephra layers have been found; there are also five Holocene cinder cones on the W and SE flanks. According to the Kamchatkan Volcanic Eruption Response Team (KVERT), a new eruption began began at about 2120 UTC on 24 March 2017. Satellite data showed an initial ash plume at about 5-6 km altitude drifting about 35 km SW from the volcano. Explosive activity was strong during 24-27 March, generating ash plumes up to 7 km high that drifted downwind as far as 2,000 km (table 1). Activity then decreased, with only minor ash emissions through 6 April, followed by ash plumes that drifted 50 and 170 km on 9 and 10 April, respectively. Only gas-and-steam plumes were reported after that time. Table 1. Chronological details of the March-April 2017 eruption of Kambalny. Data from KVERT reports. 01 Apr 2017 -- -- 200 E, SE Quiet. 02-04 Apr 2017 -- 7 -- Minor ash emissions thru 6 Apr; satellite thermal anomaly 3-4 Apr. 12 Apr 2017 -- -- -- Gas-and-steam activity. 21-28 Apr 2017 -- -- -- Moderate activity. 05 May 2017 -- -- -- Aviation Color Code Yellow. Moderate gas-steam activity. 19 May 2017 -- -- -- Aviation Color Code Yellow Green. Only gas-steam activity during last month; explosive phase began 24 Mar, ended 10 Apr 2017. 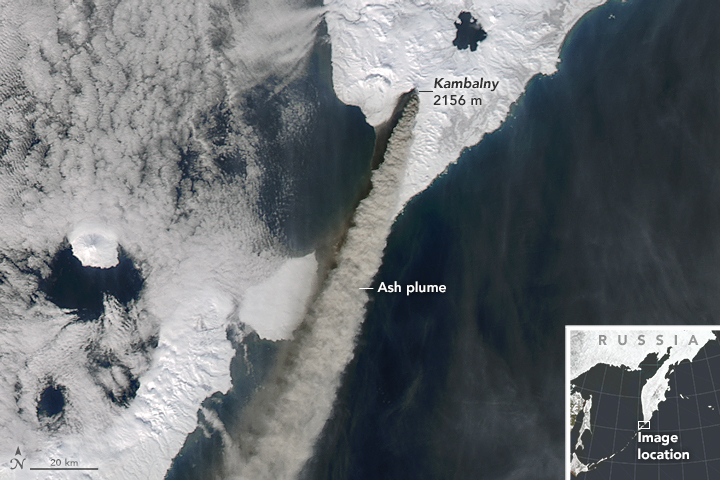 On 25 March satellite imagery showed an ash plume stretching about 100 km SW of the Kamchatka Peninsula (figure 1). A dark stain is visible to the W of the plume, where ash has covered the snow. 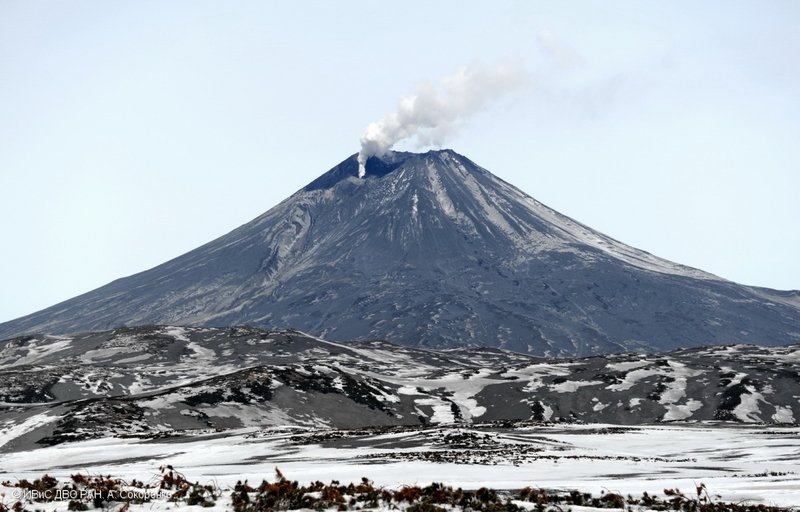 By 26 March ashfall had covered the ground on both sides of the volcano. The eruption was also observed on the ground by staff at the South Kamchatka Federal Wildlife Sanctuary (figure 2). 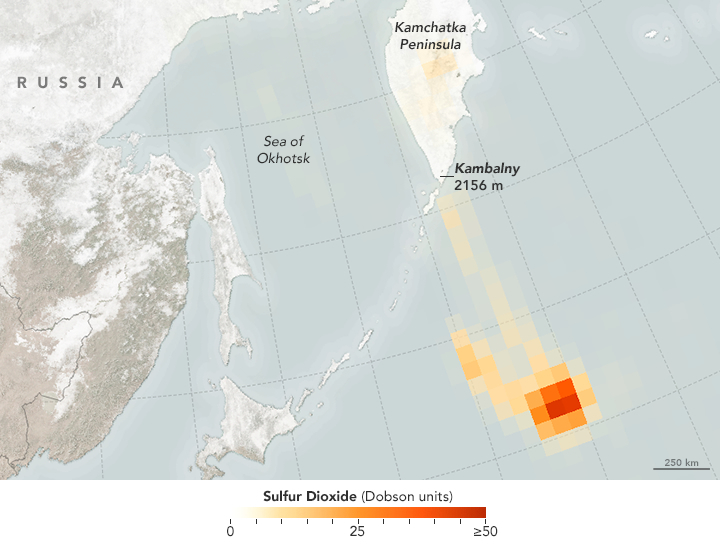 The Ozone Monitoring Instrument on the Aura satellite observed an airborne plume of sulfur dioxide (SO2) trailing S of Kamchatka on 26 March 2017 (figure 3). Figure 1. The Moderate Resolution Imaging Spectroradiometer (MODIS) on the Terra satellite captured a natural-color image of Kambalny and its plume on 25 March 2017, the day after it began to erupt (N to top of photo.) By 0134 UTC (1334 local time) that day, the plume stretched about 100 km SW. Courtesy of NASA Earth Observatory; image prepared by Jeff Schmatlz and Joshua Stevens using MODIS data from LANCE/EOSDIS Rapid Response, and caption by Pola Lem. Figure 2. Eruption of Kambalny on 25 March 2017. Photo by Liana Varavskaya, South Kamchatka Federal Wildlife Sanctuary (URL: http://www.kronoki.ru/news/1187). Figure 3. Sulfur dioxide in the 26 March 2017 plume from Kambalny eruption. Courtesy of NASA Earth Observatory; map by Joshua Stevens using data from the Aura OMI science team. 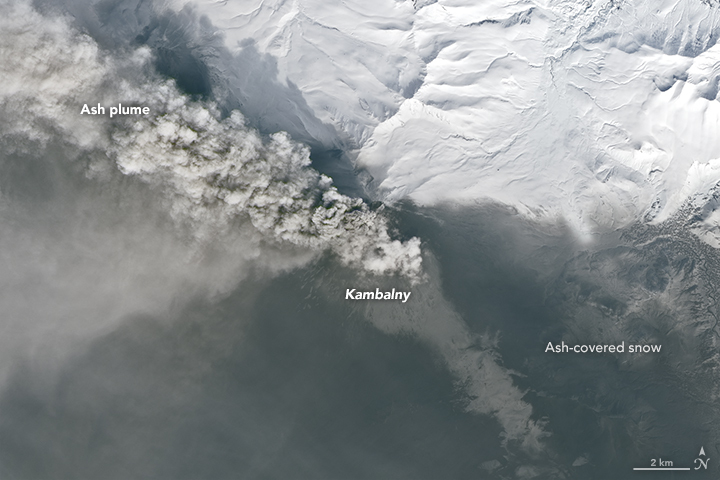 On 28 March 2017, the Operational Land Imager (OLI) on the Landsat 8 satellite acquired a natural-color image of an ash plume from Kambalny (figure 4), including a large area of ash-covered snow. When photographed by scientists on 12 April (figure 5), the entire edifice was covered by ash and there was a gas-and-steam plume rising from a crater fumarole. Figure 4. Ash plume from Kambalny moving WNW on 28 March 2017. A large area of ash-covered snow is visible across the southern portion of the image. Courtesy of NASA Earth Observatory; image by Joshua Stevens using Landsat 8 OLI data from the U.S. Geological Survey. Figure 5. A small gas-and-steam plume rises from a fumarole in the Kambalny crater on 12 April 2017. View is from the S. Photo by A. Sokorenko; courtesy of IVS FEB RAS. Information Contacts: Kamchatka Volcanic Eruptions Response Team (KVERT), Far Eastern Branch, Russian Academy of Sciences, 9 Piip Blvd., Petropavlovsk-Kamchatsky, 683006, Russia (URL: http://www.kscnet.ru/ivs/kvert/); Institute of Volcanology and Seismology, Far Eastern Branch, Russian Academy of Sciences, (IVS FEB RAS), 9 Piip Blvd., Petropavlovsk-Kamchatsky 683006, Russia (URL: http://www.kscnet.ru/ivs/eng/); South Kamchatka Federal Wildlife Sanctuary, Ministry of Natural Resources and Ecology of the Russian Federation, Kamchatka Territory 684000, Russia (URL: http://www.kronoki.ru/); NASA Earth Observatory, EOS Project Science Office, NASA Goddard Space Flight Center, Goddard, Maryland, USA (URL: http://earthobservatory.nasa.gov/); NASA Goddard Space Flight Center (NASA/GSFC), Global Sulfur Dioxide Monitoring Page, Atmospheric Chemistry and Dynamics Laboratory, 8800 Greenbelt Road, Goddard, Maryland, USA (URL: https://so2.gsfc.nasa.gov/). On 5 May KVERT reported that conditions at Kambalny were quiet the previous week. The Aviation Color Code was lowered to Yellow. KVERT reported that moderate levels of activity at Kambalny continued during 21-28 April. The Aviation Color Code remained at Orange. 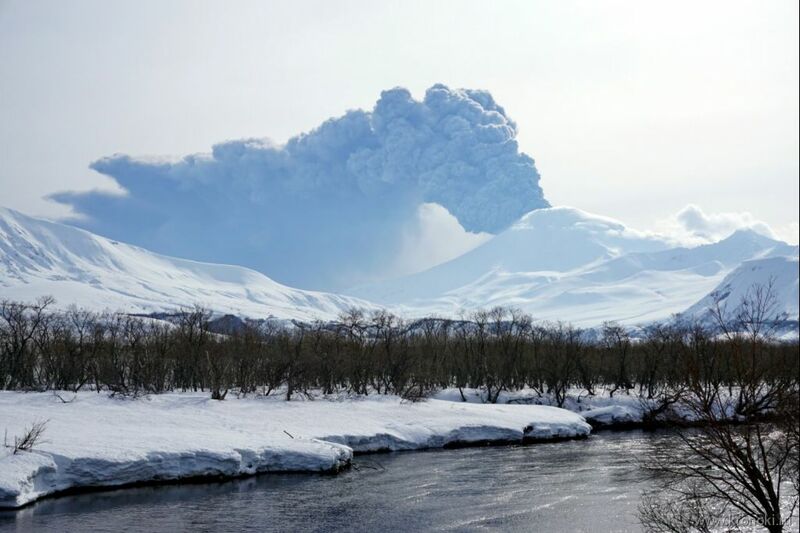 KVERT reported that the onset of an eruption at Kambalny, witnessed by staff at the Kronotsky State Nature Reserve, began at 0950 on 25 March. Satellite data showed an ash plume drifting 35 km SW at altitudes of 5-6 km (16,400-19,700 ft) a.s.l. The Aviation Color Code was raised to Orange (the second highest level on a four-color scale). The eruption intensified later that day, with ash plumes rising as high as 7 km (23,000 ft) a.s.l. and drifting as far as 255 km SSW. Ash plumes continued to be generated at least through 28 March, varying in altitude from 3.5-6 km (11,500-19,700 ft) a.s.l. and drifting as far as 1,350 km SSW, S, SSE, and SE during 26-27 March, and 51 km W on 28 March. 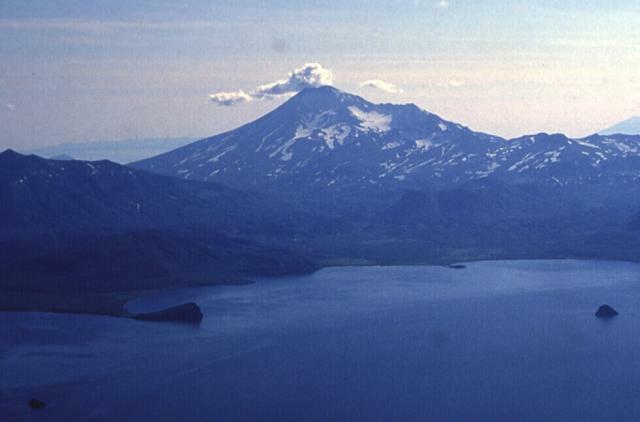 The southernmost major stratovolcano on the Kamchatka peninsula, Kambalny has a summit crater that is breached to the SE. Five Holocene cinder cones on the W and SE flanks have produced fresh-looking lava flows. Beginning about 6,300 radiocarbon years ago, a series of major collapses of the edifice produced at least three debris-avalanche deposits. The last major eruption took place about 600 years ago, although younger tephra layers have been found, and an eruption was reported in 1767. Active fumarolic areas are found on the flanks of the volcano, which is located south of the massive Pauzhetka volcano-tectonic depression. There is no Deformation History data available for Kambalny. There is no Emissions History data available for Kambalny. A cumulus cloud rises above the summit of Kambalny, the southernmost large stratovolcano on the Kamchatka peninsula. 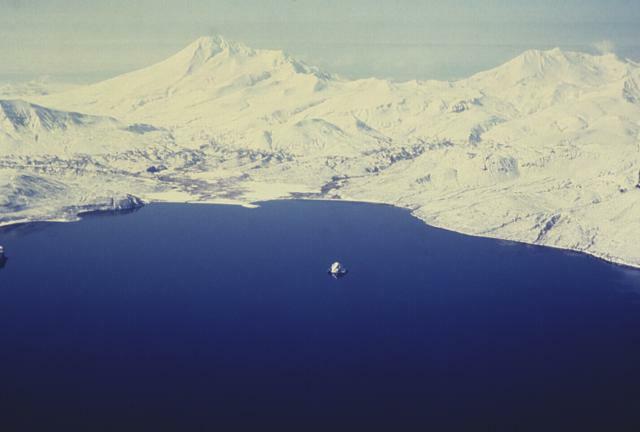 The 2156-m-high compound volcano rises above the SW shores of scenic Kurile Lake caldera. There are no records of historical eruptions from Kambalny although very youthful cinder cones and lava flows on the west and SE flanks suggest the possibility of very recent eruptions. Active fumarolic areas are found on the flanks of the volcano. There are no samples for Kambalny in the Smithsonian's NMNH Department of Mineral Sciences Rock and Ore collection. Large Eruptions of Kambalny Information about large Quaternary eruptions (VEI >= 4) is cataloged in the Large Magnitude Explosive Volcanic Eruptions (LaMEVE) database of the Volcano Global Risk Identification and Analysis Project (VOGRIPA).